Atlas Biomed is a health company that utilizes the latest genetic technologies to help its users navigate their way toward positive lifestyle changes and a healthier future. It was founded in 2016 in London and currently offers tests that cover the most applicable and actionable segments of biotechnology, genetics, medicine, and microbiome science. The professional team behind Atlas Biomed uses the most advanced scientific breakthroughs in service of your health. 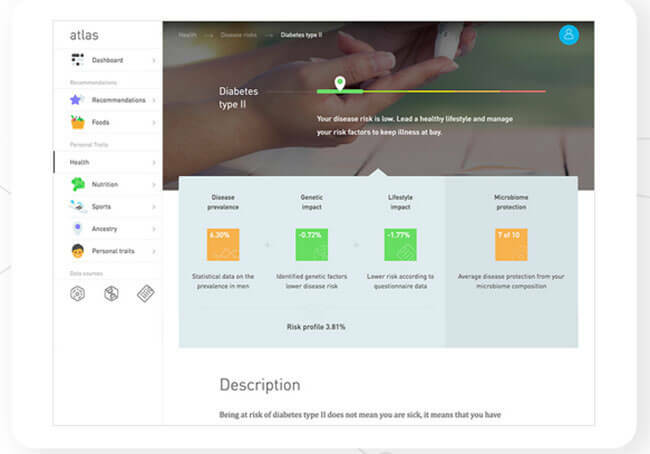 If you’re interested in using your genetics to turn your life around healthwise, read our comprehensive Atlas Biomed review and learn how the company can help you on your mission. Placing an order – It all begins by picking one of the tests (or both) and placing an order on the official website. To do this, you’ll have to create a personal account on the site, which only requires your email and password. Registering the kit – Once your personal testing kit arrives, you should link it to your account on the Atlas website. You’ll be prompted to enter your personal ID code during the registration, which you can find on the sample container included in the kit. If you don’t register your test barcode, the company won’t be able to grant you access to your results. Collecting the sample – Depending on the test you’ve chosen, you’ll have to collect a saliva or stool sample and secure it in the provided containers. Every personal testing kit comes with detailed instructions, which take all the guesswork out of the equation. If you’re providing a saliva sample, make sure to prevent accidental contamination with food, cigarette smoke, chewing gum, and sugared beverages. You also shouldn’t collect the sample right after you wake up. Your stool sample, on the other hand, should be kept outside at room temperature instead of being refrigerated once sealed in the designated container. Returning the kit by post – Once your specimen is collected and secured, simply seal it in the provided biohazard bag, put the bag in the box the kit came in, and mail it back to the lab. The original box comes with a prepaid postage, so you don’t have to worry about any extra expenses. Inspecting your results – 4-8 weeks after the lab receives your sample(s), your results should be available on your personal account. Note that each sample is analyzed on a case-by-case basis, so the company will inform you if it needs more time for processing. You will also receive an email notification the moment your results are ready. Atlas offers two different testing solutions; one inspects your DNA, the other checks your microbiome (the gut bacteria). 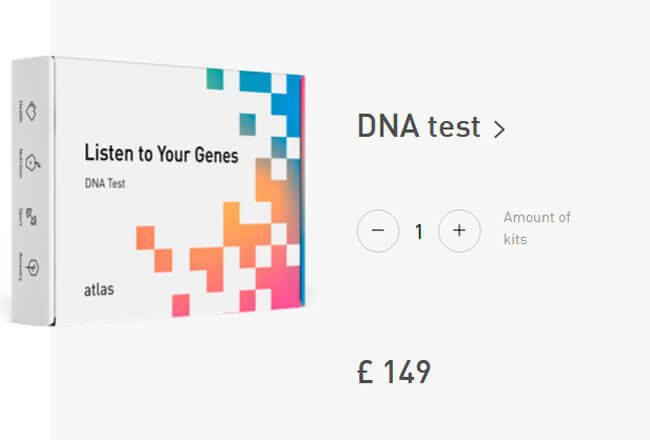 Atlas DNA test was developed and tested by an international team of renowned scientists, reviewed by the Scientific Board of Advisors, and registered with the MHRA in the UK. It is compliant with ISO-15189 demands and covers more than 400 different traits and indicators. The only restriction or condition is that potential customers must be over 18. The ancestry-related part of the test checks more than 750,000 SNPs all over your genome. Health – Health status, disease risks (17 different diseases), hereditary disease (283 hereditary genetic conditions). Nutrition – Metabolism (how fast your body neutralizes caffeine and assimilates carbs/fat), eating behaviors, vitamins & minerals, food intolerances, food recommendations. Sports – Strength and muscle mass, endurance, metabolism, injury risk. 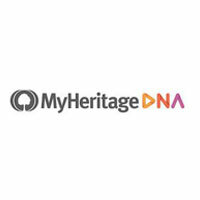 Ancestry – Origins and historical migrations of your ancestry, paternal/maternal haplogroups, ethnic heritage (200+ populations checked), percentages of Neanderthal genes in your genome. Personal traits – These vary from one test subject to the next but can include early gray hair, pain sensitivity, sneezing triggered by sunlight exposure, and many others. Atlas DNA test features an accuracy ratio of 99.9%. Your genetic information will be analyzed via DNA microarray technology from Illumina, which is the world’s leading company in the field of in vitro diagnostics. If you so choose, you can also download your raw data file and use it with other DNA testing companies. The test will tell you if you have a balanced diet and whether your microbiome receives enough nutrients to work effectively. It’ll also determine your risk of vitamin deficiencies and whether or not you consume enough fiber. Finally, it’ll gauge the composition of your microbiome and (if needed) tell you which foods to add to your diet in order to enhance the growth of healthy bacteria. All this will help you strengthen your immunity, stabilize weight, increase stress resistance, and improve your mood on a daily basis. Unlike traditional lab analyses, the Atlas test will not only determine the qualitative composition of your gut bacteria but calculate the proportion between different types as well. It uses a testing method called 16S rRNA sequencing, which is able to detect bacteria that can’t be cultivated in Petri dishes, a routinely employed method for stool sample analysis. Since the main goal of the test is to provide you with an accurate representation of your normal microbiome, you won’t have to implement any changes to your diet prior to testing. When it comes to stool sample collection, however, you won’t be able to produce a viable sample if you’re experiencing any gastrointestinal symptoms. Additionally, you won’t be able to perform the test if you’ve been taking NSAIDs/antibiotics or have undergone surgery in the last 3 months. 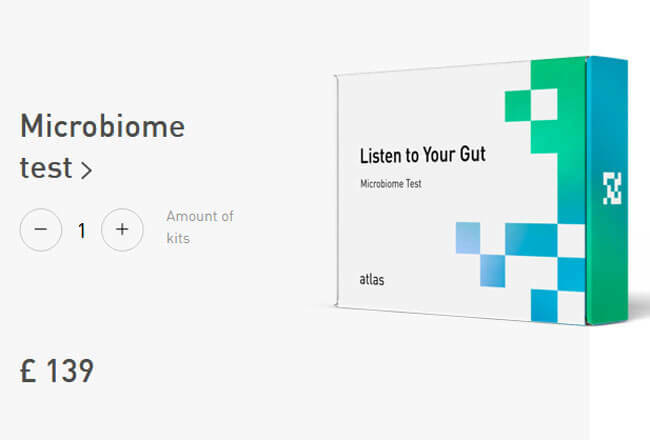 Finally, you can opt for the so-called Atlas Microbiome Test subscription mode, which allows you to automatically receive a test kit every three months. Note that the price of the kit is charged from your bank card only after it has been delivered. This subscription doesn’t have an inherent end date, but you can cancel it whenever you choose by contacting user support at hello@atlasbiomed.com. 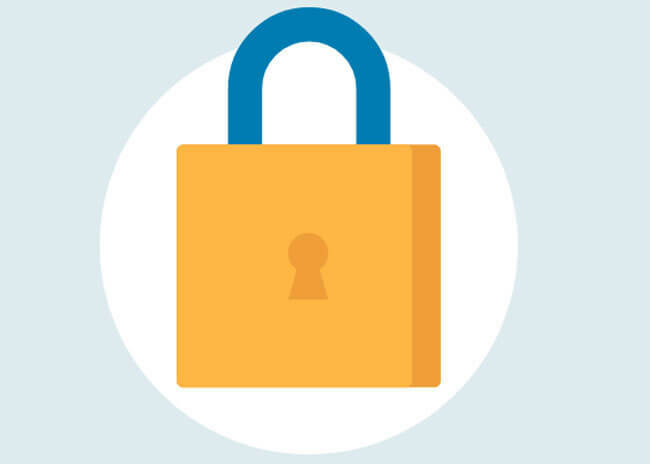 Personal data – This includes your first/last name, email address, phone number, address, state, postal code, city cookies, and usage data. Health and lifestyle information – This information is gathered through various questionnaires about your health and family medical history, known allergies, received or ongoing treatments, medications, and relevant lifestyle info, such as alcohol consumption or smoking. Biological samples – This includes saliva and/or stool samples provided by you. Usage data – This includes IP address, browser type, login information, browser version, plug-in types and versions, time zone setting, OS and platform, products you viewed or searched for, download errors, page response times, lengths of visits to certain pages, methods used to browse away from the page, timestamps, and other data. Information from third parties – Atlas can also receive personal information from its distributors, sales partners, and companies that are otherwise related to its sales channels. These can include your first/last name, email address, phone number, and address. The Atlas tests are currently available in the UK, the Netherlands, Sweden, Belgium, Denmark, Luxembourg, Ireland, and Finland. If you want to place an order to another country, you can contact user support to find out if the company can make an exception for you. Atlas only accepts Visa and MasterCard as payment methods. The tests can also be ordered as gifts and sent either to your address or directly to the gift recipient. Note that the company doesn’t offer gift-wrapping services at the moment. Atlas Biomed is one of the rare companies that offer the best from both DNA testing worlds. Of course, we are talking about ancestry and health DNA screening. There are many companies that try to combine the two, unaware of the infrastructure required for this endeavor. In most cases, their service is spread too thin over these two fields, which definitely reflects (negatively) on the final results. Atlas is more geared toward health DNA testing, but its ancestry exploration is also up to par. This makes it a perfect company for people who want to learn more about their health predispositions and genetic heritage without having to order multiple testing solutions. Since your final results will include a wealth of quite complex information, it also might be a good idea to have an expert interpret certain parts of the report for you. Our ratings are the result of an objective and independent evaluation of Atlas Biomed , generating the final rating that reflects the overall quality of the company. Ratings may change as the service changes. 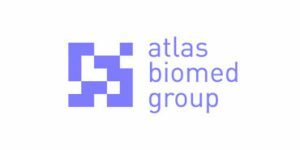 Atlas Biomed user rating based on 2 user reviews. The kit arrived pretty quickly and the whole process was pretty simple. I haven’t heard from the company in a month after sending my sample back and then received an email message about my report. The results were definitely overwhelming at times since I didn’t always understand all the information, but they definitely give you a ton of interesting content to explore alongside very good personal recommendations. Would order the test again even if it didn’t offer ancestry results for the dietary analysis alone. We found 0 verified Atlas Biomed discounts for April, 2019.